Audio Analytic demonstrated its sound recognition software running on Frontier Smart Technologies’ smart speaker reference platform as part of its intelligent home showcase at CES 2019. We see smart speakers as a central part of the intelligent home, offering a range of other applications on top of music and entertainment, such as security, safety, health and wellbeing. A concept that smart speaker owners have reacted strongly to. The partnership with Frontier, a leading system integrator recognized by Amazon, Apple and Google for smart audio and smart home devices, will enable advanced smart speakers to help in a range of scenarios. We envision an intelligent home that adapts to its occupants during the day. In our recent survey of 6,000 consumers in the US and UK, 75% of those with children under 16 years old would give their home permission to monitor their children when left home-alone, and 60% would give the smart home permission to look after the wellbeing and health of people with additional needs, such as the elderly. These are two clear opportunities for smart speaker manufacturers. During CES 2019 we demonstrated how a smart speaker can be playing music while also listening out for critical sounds, such as a smoke or CO alarm or window being broken. This is particularly important for those with teenagers who are home-alone after school or elderly relatives they want to monitor remotely. Upon recognising such a sound, the device can alert the parent and pause the music, or take further steps by informing a professional security company or neighbour. “Extending our partner programme and working with a trusted leading systems integrator such as Frontier is another opportunity to add a wider sense of hearing to smart speakers beyond just voice. Our research shows that consumers are positive about the role of artificial intelligence in helping them and adding AI capabilities like sound recognition enables smart speaker devices to evolve from smart to intelligent,” says CEO and Founder of Audio Analytic, Chris Mitchell. “We are delighted to be working with Audio Analytic to introduce their sound recognition technology into our smart audio solutions. Smart speakers, with their powerful processors and high-fidelity audio inputs, are the ideal devices in which to include sound recognition capabilities. This collaboration will enable our customers to address an extended range of use cases in a single smart audio device” says CEO of Frontier Smart Technologies, Anthony Sethill. 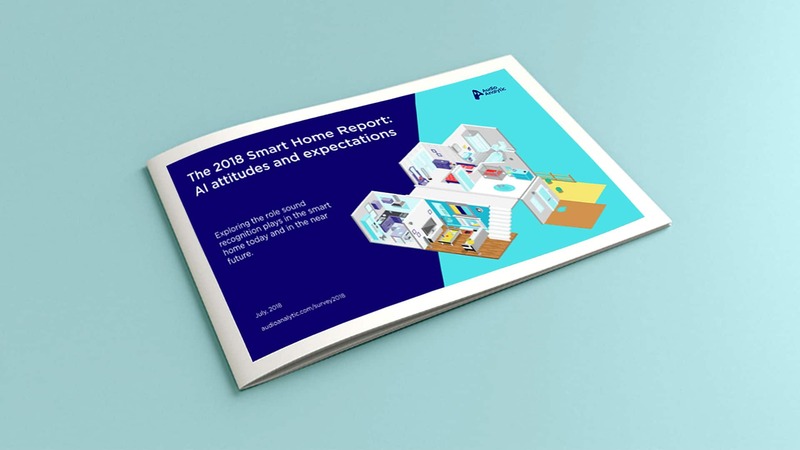 The research Chris is referring to is summarised in our free 2018 Smart Home Report. Sixty-six per cent want Alexa, Google, Siri and co to interact with them in a more natural way by responding to the sounds of occupants coughing, sneezing and snoring, as well as recognising the sound of a child crying or somebody knocking at the door. 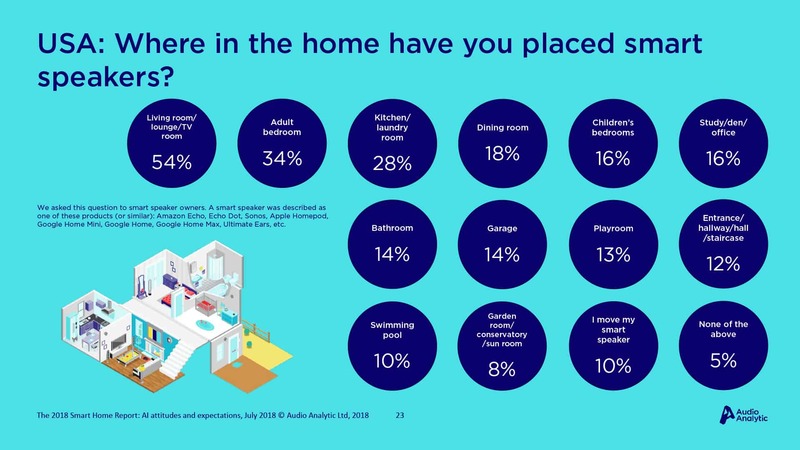 The extensive survey of 6,000 US and UK customers exploring the role of AI and sound recognition in the smart home showed a strong demand among consumers for products that can use AI to help them, whether that is keeping the smart home safe and secure, tracking the health of their families or making sure that music being played adapts to what is going on around them. 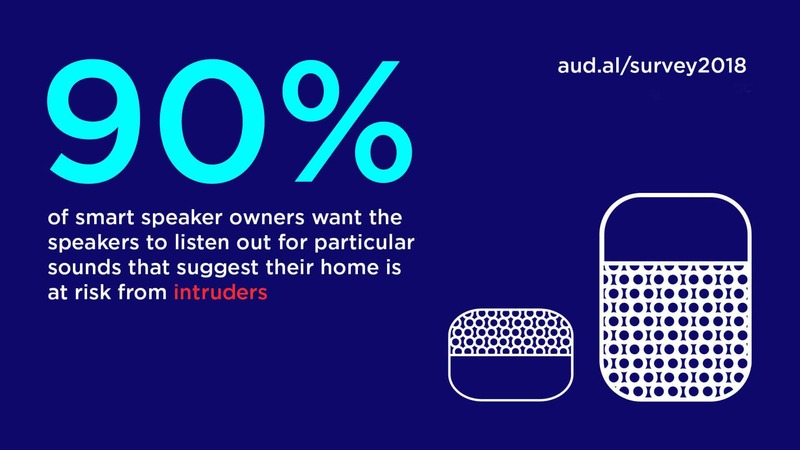 Our research also shows that smart speakers are already placed in key areas of the home, so although we see smart speakers playing a key role in safety and security, giving them a broad sense of hearing enables these highly desirable devices to offer a wide range of benefits. It won’t be long until smart speakers of all form factors are found in every room in the average home. Frontier Smart Technologies Group is a pioneer in Digital Radio, Smart Audio and Smart Home technologies. Frontier is the world leader in solutions for Digital Radio – providing chips and modules to all major brands in the consumer audio sector. The company is a leading system integrator working closely with Google, Amazon and Apple. Frontier’s role is to enable third party brands and ODMs to develop voice-enabled speakers using the AI platforms of the major ecosystem players. Audio Analytic is the pioneer of artificial audio intelligence, which is enabling a new generation of smart products to hear and react to the sounds around us.